I am always reminded why so many families want to relocate and move to the Mountains of West Virginia and especially Greenbrier County. We have so many wonderful activities and unique experiences right here in our back door. This past weekend we visited the Swinging Bridge Restaurant in Paint Bank, VA just across the West Virginia boarder on Rt. 311. I am sure that many of you have been there but, those that have not had the pleasure of eating at the Swinging Bridge Restaurant; I encourage you to take the 50 minute drive on Rt. 311 and enjoy the atmosphere and home cooking. 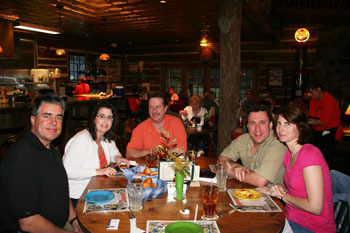 Jill and I met our friends from the Roanoke area and enjoyed a great meal and friendship. I have to say when you open the menu and see Warning – be prepared to “slap your Mama ‘cause she don’t cook like this no more.” I knew the food would be good. The restaurant specializes in farm raised Highlander Beef and Buffalo meat. Of course we all ordered the Buffalo Burgers and Steaks! As you enter the Restaurant there is the Paint Bank General Store and the Swinging Bridge Restaurant is located in the back section. The General Store actually sells the buffalo meat to take home and many other organic items. As you enter the restaurant you see the swinging bridge above on the second level along with a Christmas Shop on the second floor. The restaurant has an ‘open kitchen’ and a setting area in the center of the restaurant featuring a huge stone fireplace. We found the staff to be very pleasant and the service was great. I highly recommend desert, my favorite was the homemade chocolate brownie with ice cream and hot fudge! 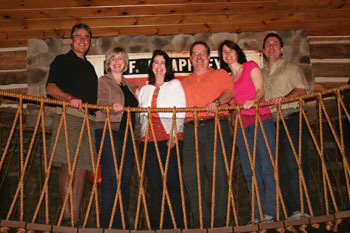 I hope everyone has a chance to visit the Swinging Bridge restaurant and tour the Buffalo Farm. For additional photos of the restaurant please visit www.swingingbridgeresturant.com.